Led by expert fertility specialists, Dr. Armağan Ulubaş, euroCARE IVF is an all-encompassing IVF center located in the Turkish Republic of Northern Cyprus. Our North Cyprus fertility clinic operates year-round and employs only the leading fertility specialists in the field of Assisted Reproductive Technology (ART). Our goal is to ensure that you receive the highest quality of care in a comfortable, inviting atmosphere. The euroCARE IVF program in North Cyprus includes services in all aspects of Assisted Reproductive Technology. It is certainly not an easy decision for women when it comes to the idea of needing the help of donor eggs. At euroCARE IVF Clinic, we understand this and we will do everything in our power to help you achieve pregnancy using your own eggs — as part of your treatment cycle. Are you a Good Candidate for Tandem Cycle Treatment? Tandem Cycle IVF treatment at our North Cyprus fertility center is suitable for women who have a history of failed cycles, have low ovarian reserve, or who produce poor quality eggs and who wish to give themselves the best possible chance of using their own eggs for pregnancy. How Does Tandem Cycle Work? A Tandem Cycle follows essentially the same steps as a standard IVF cycle. The donor is specifically selected and as you begin your stimulation injections, the donor will also begin the stimulation phase at our clinic in North Cyprus. This will ensure the perfect timing of both sets of eggs to be ready for collection together at the clinic. Both sets of eggs will undergo fertilization with your partners sperm by ICSI and then are monitored by our expert laboratory team. We are then able to see how both sets of embryos develop and the decision is then taken, between you and our fertility doctors, on how many embryos to transfer. Depending on the embryo quality it is possible to transfer only your own eggs, only donor eggs, or a combination of both. For Tandem Cycle treatment it is best to allow enough time in Cyprus for day 5 blastocyst transfer. Generally 10 days in Cyprus gives you enough time, however dates will be discussed with you when you speak to your patient coordinator. If you wish to come to Cyprus for the full treatment, then you would need to be here on day 1 of your period and stay for approx 20 days. You can have the necessary tests carried out here and go on to have the treatment at this time. Our doctors will be able to better monitor your progress the longer you can stay in Cyprus. Tandem Cycle treatment is not available in many clinics around the globe. 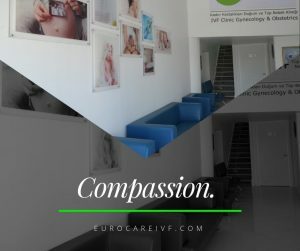 At the leading fertility clinic in North Cyprus, euroCARE IVF, we are able to offer this outstanding treatment. We effectively combine an IVF and Egg Donor cycle, and help you save money in the long run — rather than entering an IVF cycle, being unsuccessful, and then moving forward with an egg donation cycle. Our successful team is giving you the chance to use your own eggs while also having donor eggs as a back up plan for current/future cycles. If you have any questions, our patient coordinators will be with you every step of the way in planning your IVF journey.